Your flights are booked. Your small group trip is locked in. You’ve had your shots, organised the cat-sitter, and told your friends/family/neighbours/local greengrocers – pretty much anyone who’ll listen – about your upcoming safari to Kenya/Tanzania/Botswana/South Africa. There’s just one thing left to do: pack. What clothing should I take? The classic traveller mantra of ‘layers, layers, layers’ is a pretty handy one to keep in mind when you’re packing for safari. It can get hot in the overland truck, so bring light, comfortable clothes that you can move around in easily. Nylon and synthetics are a no-no; cotton and other breathable materials are much better. Try and pack garments that are easy to wash and dry; while some people like to wear jeans in the evenings, they’re no good for trekking and they can take a while to dry. A sunhat and sunglasses are essential. Check the weather before you leave, but even in the summer you’ll need some warm clothing for the nights and early morning game drives; consider bringing a fleece, beanie, thermal underwear and a wind-proof jacket. Bringing a light scarf for the dual purpose of warmth and sun protection is always a good idea; in many destinations you can even pick up a traditional woven blanket or wrap, such as the bright (and warm!) Maasai shukas of Kenya and Tanzania (ask your leader where the best place to buy one is so you know your money is going into local pockets). The distinctive red ‘shukas’ worn by Maasai warriors in Kenya. Image c/o Steve Wroe. 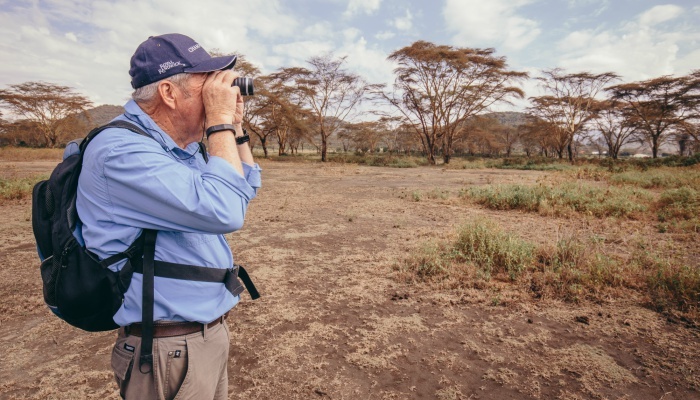 While you won’t need heavy duty hiking boots on most overland safaris, comfortable, closed in shoes are a must, as most trips incorporate some bush walking, and you’ll want to protect your feet around the campsites from grass and insect bites. There’s a lot of schools of thought around the best colour palatte to choose for your safari lookbook: don’t wear bright colours (especially red), as you might attract wild animals; don’t wear darks, as you’ll attract insects, or white, because you’ll get dirty. Plain, muted colours like cream, grey, brown and khaki are popular and practical choices (avoid military patterns), but really there’s no strict right or wrong – although you may want to avoid wearing too much black and navy in some areas due to tsetse flies. Oh, and ladies? Bring a sports bra. 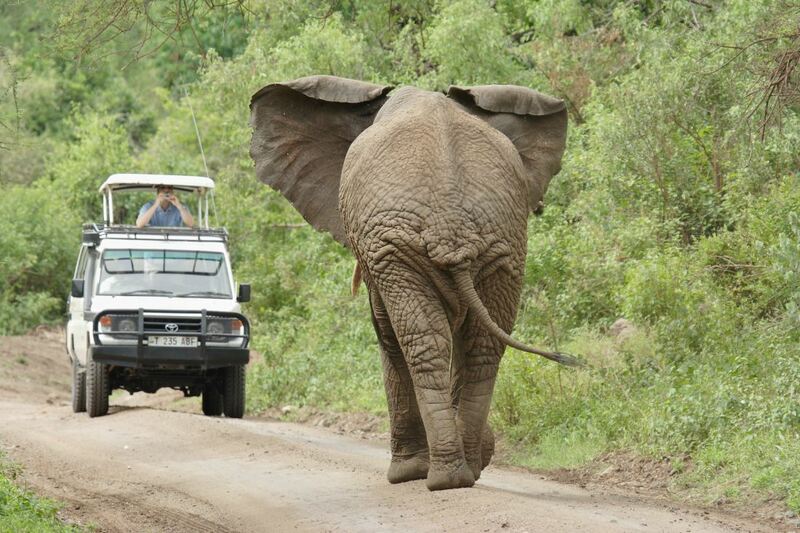 The roads in Africa can be pretty bumpy. How about toiletries & medication? Out on the road, a ready supply of wet wipes, tissues and zip lock bags (to discard used wipes) is your best friend. You’ll be able to shower everywhere you stay, but things can get pretty dusty in the truck. You’ll also need sunscreen and tropical strength mosquito repellant, which you can pick up from a pharmacy or travel doctor before you leave. Your overland crew will provide you with hand soap if you’re stopping for lunch on an all-day game drive, but some travellers like to have a small bottle of hand sanitizer with them – also helpful for any ‘bushy bushy’ toilet stops with minimal facilities. Most trucks will have a roll of toilet paper on board, but pocket tissues are always handy (or you can purchase your own toilet paper supply along the way). While the crew will have a first aid kit with them, it’s always a good idea to bring a small version of your own, equipped with basics like bandaids, painkillers and rehydration salts, just in case. As soon as you book your trip, make an appointment to see your travel doctor; they’ll be able to give you more information about any other medication you might need to take with you. Inside a Peregrine overland truck in the Masai Mara. Image c/o Damien Raggatt. On an overland safari, your main luggage will be stored in a compartment at the back of the truck, so a soft-sided bag or backpack (with no external frame) is best. While you should avoid hard suitcases, soft bags with wheels are fine as long as they also have a carry handle or strap to move around easily. Peregrine has a couple of trips where passengers must have a soft bag, so make sure you check your trip notes. You’ll also need a daypack to hold your water, camera and anything else you want to keep with you on game drives, walking safaris and other included activities. The weight limit for luggage on all Peregrine trucks is 15-20kgs per person (you’ll find similar limits on domestic flights), so pack as lightly as you can. If your trip begins and ends in the same place, excess luggage can usually be stored at your arrival/departure hotel and collected when you’re back. You’ll be able to securely store your passport, money and airline tickets in accommodation safes and the safe on board the overland truck, but avoid bringing unnecessary valuables. It’s also a good idea to bring a money belt or pouch. If you’re travelling with a tablet or laptop, you’ll find wifi in the common areas of most lodges and tented camps, but some are specifically designed without this mod con so guests truly get off the grid. It may seem like an inconvenience at the time, but many travellers end up finding this forced detox one of the highlights of the trip. Bring your camera! Image c/o Damien Raggatt. Camera (with extra memory card). Africa’s national parks are a photographer’s dream, but we stick to the driving parks and don’t ‘chase’ down wild animals to get close for a photo. While some travellers are content with using their smartphone, most prefer a DSLR or point-and-shoot with zoom capabilities. Spare camera battery. Lodges and permanent tented campsites will have charging facilities, but sometimes the generators are switched off at night. Make sure you’ve fully charged your camera ahead of all-day drives. Binoculars. There should be a pair on board the truck, but bring your own for better viewing. Water bottle (we recommend at least a 1.5-litre capacity). You can bring your own or buy one at a supermarket along the way. Bottled water is readily available throughout Africa, but for environmental reasons it’s best to refill a reusable bottle wherever possible. Your crew will keep drinking water on board the overland truck, but most people tend to buy their own 10-litre bottle and keep refilling their smaller one. Just make sure you avoid tap water! A good quality, high-beam headlamp or torch for around the lodges and tented camps at night. Converter and double adaptor. While Peregrine’s overland trucks do have power boards, they’re used at the crew’s discretion so as to not drain the vehicle’s battery. There are sockets in all lodges and campsites for recharging phones and cameras, however. Check your Essential Trip Information for specific country adaptor requirements. Entertainment. Most of the time the sights outside your window will be enough to keep you absorbed, but a portable music player, journal and/or a good book are always welcome company on longer drive days. Do I need a sleeping bag or other camping equipment? 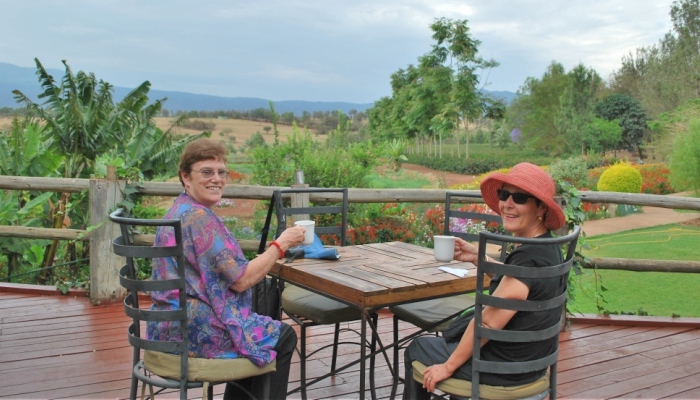 Enjoying a coffee at a safari lodge in Kenya. Image c/o Kristy Flay. It depends on the style of tour you’re doing. On a Peregrine safari you won’t, as you’ll be staying in a range of comfortable 3-4 star accommodation including locally run hotels, safari lodges, permanent tented camps, even a houseboat (if you’re in the Okavango Delta in Botswana). Even the tented camps are set up with beds and linen. You may, however, wish to bring a sleeping sheet with you, especially if you’re travelling during the hot season. Again, check your trip notes for more information. Feature image c/o Phil Ellinger. Now, ready for your adventure? 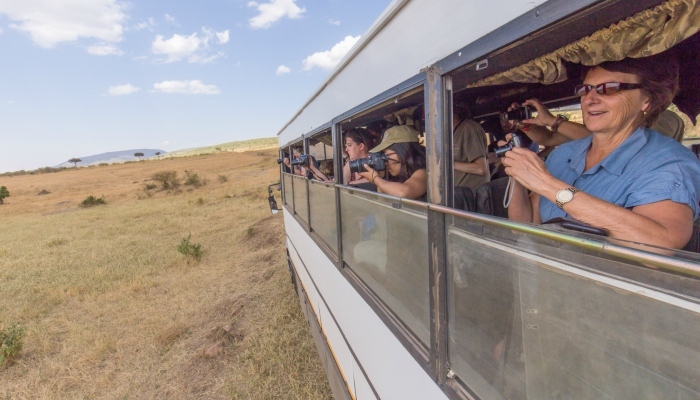 Browse Peregrine’s range of safaris in Africa, or read more about overlanding here.